Studies in recent years suggest that North American weather is becoming more extreme and unpredictable. This year’s outbreak of tornados was relatively quiet until a fierce round of storms in mid-April. But two years earlier, twisters cropped up in record numbers and caused substantial damage in several states. No matter how large or intense, severe storms that includes booming thunderstorms, twisters and even hurricanes can destroy or significantly damage landscapes in a blink of an eye. Many times, the difference between minimizing damage and sustaining a total loss to trees, beds and gardens comes down to how well the landscape is managed. 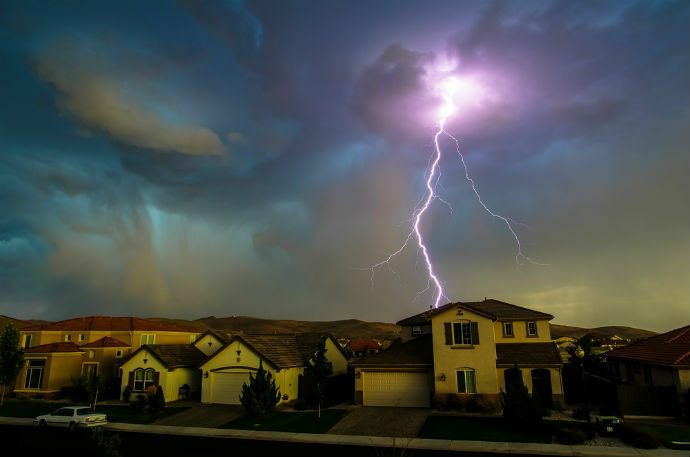 Proper preparation is essential for this time of year, when storms sometimes unpredictably form and race across the country leading up to the start of hurricane season on June 1. Chris Lee, who is president of Dallas-based Earthworks, says that maintaining a green thumb year-round on the landscape will enhance its chances of surviving high wind, heavy rain and hail. Properly maintained trees are more likely to stand up to Mother Nature. Proper pruning and maintenance enables trees young and old to withstand heavy gusts of wind. Pruning low-hanging branches and removing dead or weak limbs is good practice. Also, inspect for fungal growth at the base of the tree. This could be a sign that the tree has heart rot or decay and is severely weakened. Limbs that encroach upon the structure should be removed. Since Hurricane Andrew in 1992, the University of Florida has done extensive research on what types of trees can better withstand gale-force winds and hurricanes. Among a group of palms, dicots and conifers with the highest wind resistance are crape myrtles, southern magnolias, live oaks, bald cypress, certain hollies and sand live oaks (common in Florida). The study suggests avoiding most fruit trees, pines, southern red cedars, laurel oaks and sycamore trees. Trees and large bushes that are planted too close to structures and near utility lines are a recipe for disaster. Trees that will grow to be large should be planted far enough away from the dwelling to minimize any damage to the structure caused by severe weather. Smaller trees and bushes – like hollies and crape myrtles – are better options to plant closer to the dwelling. Keep them trimmed back so they are less likely to damage windows, awnings and roofs during a storm. Trees and bushes that are planted in groups have a better chance of standing up to high winds. The cluster ultimately provides a safety net for many of the plantings in the interior. Lee says that the landscape won’t always survive even Mother Nature’s most damaging blows, but taking a strategic approach to planting and maintaining the landscape can minimize damage from some severe storms. A new plant or tree that is properly “set” into the landscape has a greater chance of latching onto the earth and holding tight during a storm. When planting, the roots at the bottom of the root ball should be exposed slightly to get a jump on penetrating the soil. It’s best to use a mix of native soil and peat moss or potting mix when planting. Keep about 60 percent of the soil that comes out of the hole, and fill around the root ball with commercially prepared peat moss or potting mix. Be sure to remove large rocks. Stake new trees and plants with a bend-not-break approach. Allowing flexibility in the lines to support the tree or plant will reduce the likelihood that it will snap during heavy wind gusts. Staking with too much tension will cause the plant or tree to snap. Stake with straps or dowels, using two or three as necessary. Determine the direction of the prevailing wind and set the stakes opposite of each other about two feet away. If winds are out of the south, place the stakes on the east and west sides.